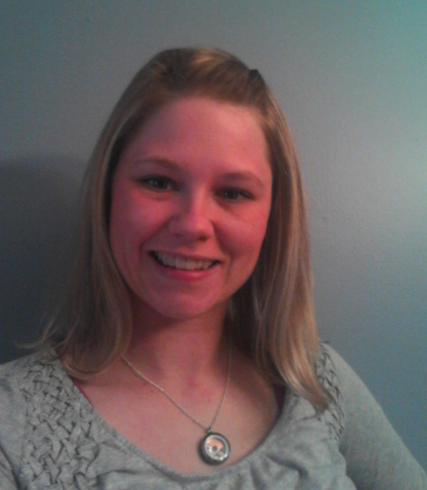 To read Part 1 of Rachel’s journey to manage her diabetes, click here. Within the past year, I started experiencing hypoglycemia unawareness, which can happen to people who have had diabetes for a long time. In my case, it has been 20 years. Very scary stuff, especially with two little ones almost always with me. Normally, when your blood sugar begins to get low, around 70, you can feel it. Many of you who do not have diabetes have experienced low blood sugar, or as it’s medically known, hypoglycemia. If you haven’t eaten or have done a lot of exercise, or in a diabetic’s case, taken too much insulin, you may begin to feel shaky, sweaty, weak and/or hungry. These are signs of hypoglycemia. You eat something or drink some juice, and your blood sugar goes up. You feel better. But what was happening to me, I was no longer feeling these signs. All of a sudden, I would feel really disoriented. The best word for me to describe it is loopy. I just felt really silly. I knew I was acting off, but I couldn’t stop it. It was scary. When I would finally test my blood sugar after one of these episodes, it was usually somewhere between 30 and 40. That’s extremely low, close to becoming unconscious and/or having a seizure. Too close. I started telling my 4 year old daughter that if I’m acting like that she needs to remind me I need to eat something, or if we were out somewhere, to get me help. That’s a scary thing – for me and for her! When I told my endocrinologist about this, she suggested I get the Dexcom continuous glucose monitoring system, another piece of technology I am forever grateful for. I contacted the Dexcom representative and within three weeks, I had the system in my possession. I had my training and have now been using the system for almost two months. It. Is. Amazing. The Dexcom is tubeless and wireless, just like my OmniPod. 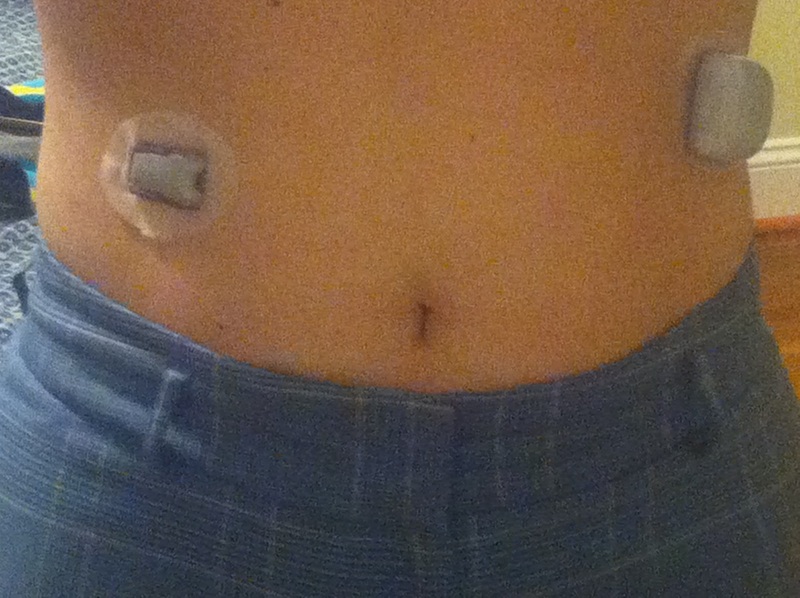 I wear the small sensor with a cannula under my skin and it tests my blood sugar every few minutes. It communicates with a small receiver about the size of an iPod that I must keep within 20 feet of myself. I change the sensor every seven days. The receiver shows me a graph with all of my blood sugars and – the thing that helps me the most – it shows me where my blood sugar is heading: if it’s staying steady, going up or down, and if it’s heading in either direction quickly or slowly. This makes all the difference in the world. Now I can see if my blood sugar is low, or getting there, even if I don’t feel the symptoms! I can completely cut off those scary, loopy episodes, and my daughter can worry much less about me. I also test my blood sugar much less often. I was testing 8-10 times a day. My fingertips looked like pin cushions! Now with the Dexcom, I test 2-4 times a day. Amazing! So I have these 2 pods attached to me at all times, and I must keep these two receivers in my purse. Sometimes I do feel like a bionic diabetic. Ha! But let’s hear it for technology!! The strides they are making towards a bionic pancreas are unbelievable. I truly believe I will see a cure in my lifetime. I have to believe it. Not even for me, but for our future generation. I know that at any moment, one of my nieces or nephews or one of my own children, could be diagnosed. But thanks to technology, I am living an almost completely normal life. And they would be able to as well. Of course, still with pokes and needles, counting carbs all day, figuring out insulin ratios, and watching pretty much every move we make. Normal. Almost. But amazing! Wow Rachel, your story is very interesting. I am with you regarding the cure for diabetics. I hope that in the near future that most if not all hypoglycemia persons will be able to have these monitors. Have you ever read of the the diabetes miracle cure. In a sense I don’t like that title because it conjures up super pills, potions and overnight relief. It comes only after eating the right foods for at least 14 days. It works best on people with high glucose. I hasten to say that I’m not a doctor so… Anyhow I’m new at all of this and just wondered.